toys-toys-toys.co.uk: Where's Wally? Can you find Wally? Where's Wally? Can you find Wally? Last year the popular red and white striped character, Wally, celebrated his 25th birthday. Created by British illustrator Martin Handford as an afterthought, that he decided to pop in to one of his scenes thinking he might be fun to find, he has now become a timeless classic. Wally has reached out to generations of children, thanks to his popular range of puzzle books that can keep you occupied for hours. The earliest version of Where's Wally was first published in 1987. 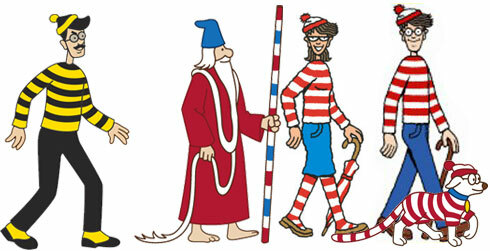 The books were published in the UK by Walker Books and in the US under the title Where's Waldo? first by Little, Brown and Company before being taken on by Candlewick Press. Since then over 58 million books have been sold worldwide. 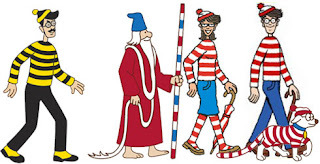 In the first two books, Wally was the only character that could be found in every illustration. Over time, more characters were added to be found in each scene. These included Wilma, Wenda, Odlaw and Woof, Wally's dog. He is known as Wali in Wales, Charlie in France, Valda in the Czech Republic, Vallu in Finland , Holger in Denmark, Valli in Iceland, Walter in Germany, Hugo in Sweden and Willy in Norway. His most famous pictures include scenes in Ancient Rome, Egypt, the Stone Age and in Outer Space. On his travels he has met Pirates, Knights, Dinosaurs and Robin Hood. 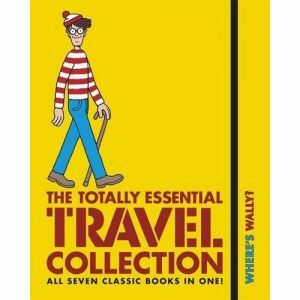 Now you can get all seven classic Where's Wally books in one handy travel-sized book. This includes: Where's Wally?, Where's Wally Now?, The Fantastic Journey, In Hollywood, The Wonder Book, The Great Picture Hunt and The Incredible Paper Chases. Check out the video below of the Where's Wally Guinness World Record attempt.